I would like to preface this with the fact that I am brand new to 3D Printing and have only been doing it for about 2 weeks now, I have been using almost exclusively Cura 4.0 and have had mostly successes. My printer is a Tevo Nereus and I'm printing with TOTALPACK3D ABS Filament. I am trying to print a small dagger I found here. 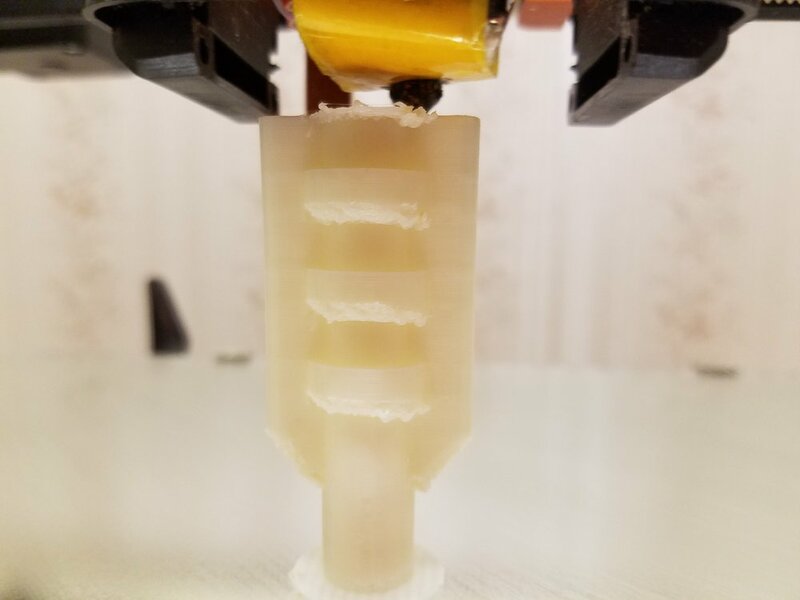 As you can see in the attached picture it prints well except areas that have overhang, especially the little "rings" or cylindrical parts. After several hours of messing with settings and several failed prints I decided the problem is within Cura, its trying to print the outer part of the rings in mid-air. I tried many different settings, I thought infill before walls would help but it doesn't seem to make any difference on or off. I will also post a picture or gif of what its doing within Cura. Any help would be appreciated, have also attached original .stl and my sliced .gcode, thanks in advance ! 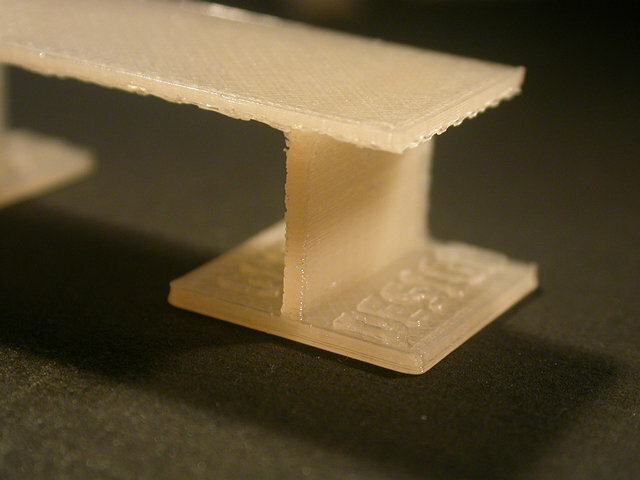 For steep overhangs you need to use supports, or redesign the part so it has no steep overhangs. 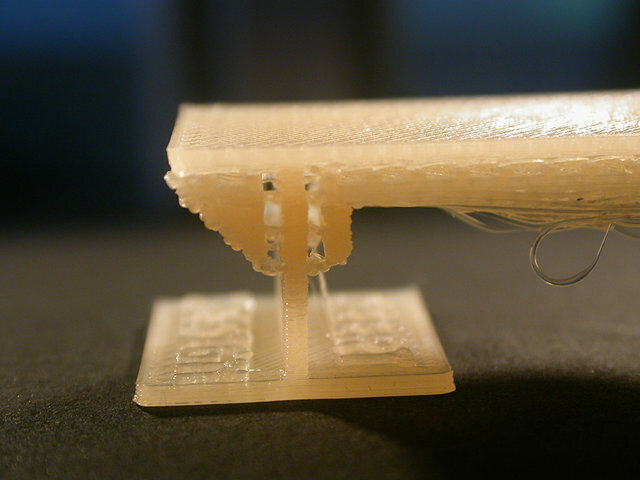 Or split it and glue both halves together, or print it in such a way that there are no overhangs while printing (if the design allows this; probably not here). I don't know your printer, so if it is a single nozzle printer, you would need supports in the same material as the print, and cut them out later. In dual nozzle printers, you can use one nozzle for the support material, and the other for the print, and dissolve the support later. You could design your own custom supports, if the model has special requirements, like I did in the test below. Or use the standard Cura-supports for general models, which is far easier. Try this on small test pieces first, before doing a big print. An example of custom supports, in order to not destroy the text below the bridge (standard supports would go all the way down). For reference: the main plates of this bridge are 1mm thick; text caps height is 3.5mm. I see what your saying, but I already modified the original print to not need supports, I changed the bottoms of the overhangs to angles rather than overhangs, but cura will try and print the outer part first which is floating in mid air as shown in the gif instead of printing the inside first which would allow it be connected and not fall. And others have printed this file with no modifications and no supports, but I couldn't get any help yet on thingiverse. Thanks.